Since 1974, Venice Pest Control has provided area residents with premium pest control services since. Our genuine commitment to our customers has made us one of Venice’s most trusted pest control companies. Our experienced staff can help you with almost any type of pest, including the numerous spider species found in Sarasota and Charlotte Counties. Wolf spiders live almost everywhere in the world, and they are common throughout Florida. Instead of building webs, these spiders use their excellent eyesight to hunt down prey. Wolf spiders are relatively large, and adults can grow to lengths of an inch or more. The two major venomous spiders in Florida are the notorious black widow and brown widow species. 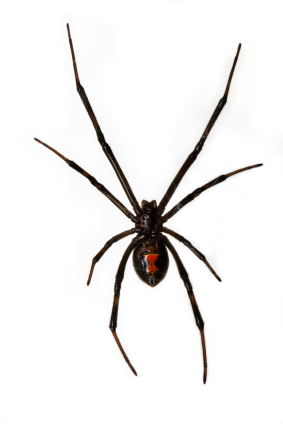 Brown recluses are not native to Florida and are rarely found in the state (Click here for more information), but black widows are a serious problem. Female black widows are the most poisonous spiders in North America, and their venom is 15 times stronger than rattlesnake venom. Black widows can easily be identified by their black bodies and red hourglass markings. Brown widow spiders are common throughout Florida, and they can be found around many homes. Brown widows are smaller than black widows and range in color from light tan to black. They typically have orange or yellow hourglass markings on their abdomens. Brown widow venom is twice as potent as the black widow, but they are unable to deliver as much venom as black widows. Spider infestations can be a health hazard, especially if the invading spiders are poisonous. Black widow bites are typically not painful at first, but symptoms such as severe pain, anxiety, muscle cramps, headaches, nausea and seizures may eventually develop. Symptoms of brown widow bites include severe pain and redness around the bite area. Wolf spiders rarely bite. If you live in Sarasota or Charlotte County and need to rid your property of spiders, contact Venice Pest Control. Customer satisfaction is always our top priority. Our trained and experienced staff will identify and eliminate spider populations in and around a structure. Contact us today to learn more about our services and to receive a free, no-obligation quote!